Blog What if we had free energy and limitless health? Would that be dystopian? What if we had free energy and limitless health? Would that be dystopian? For today’s #MondayMusings, I want to ask whether free electricity and abundant health would make a eutopia or a dystopia because I truly believe that is what our future holds! I’m gonna guess that we could build enough of these to power the whole country for a fraction of what it costs to go to war. It’s a little under a billion each and at current kW prices, it pays for itself in eighth years, I’m told. Most likely, that cost will come down as more are built. So I recently had the epiphany that we would be too productive and abundant if energy were free. If we didn’t pay utilities, gas, costs of transport and manufacturing, then families would amass too much wealth and have too much leisure time. 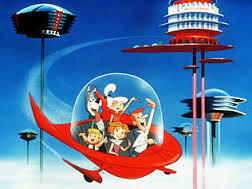 Machines could do much of our work and everything would be like “The Jetsons” without George’s 9-5 job. Although President Bush advocated war as an economic stimulus back in 2004, it seems to me that true “benefit” of perpetual war is actually wealth destruction on the scale that even massive public works like solar towers couldn’t achieve. There is also the side benefit of scaring people into submission. Of course, there would still be currency in a free-energy state because not everyone gets to live at the Ritz-Carlton although many would prefer that to an RV. But if you didn’t pay massive taxes and have to service all your loans, and if your electric car ran for decades, you could actually escape the system of continuous work/tax/paying for wars on the imperial frontiers. The second big expense is health care and if compounds can slow or reverse aging, then those costs would drop as well. So the big question is if people didn’t HAVE to work and they lived hundreds of productive years, what would ensue? not semi-retired ones whose cars and houses and student loans are paid off. Maybe some would fall into that but I believe the majority of people would prefer sobriety and productivity. So what would people do if they didn’t work and lived a really long time? I don’t think they would engage in regime change or wars of aggression and conquest, that’s for sure. I believe we would just have a LOT of people who were mediocre at playing the guitar and who decorated their houses with so-so paintings that they did. And the people who wanted kids would actually be able to spend time with them. So is it better to have a dystopia where people are wage slaves in fear of death by droning or a dystopia where people are bored? I don’t know about you, but I think most people would prefer the latter and perhaps even refer to that as a Utopia, no? Free solar energy, low cost of production, labor, and transportation, and good health? To some plutocrats, that might seem like hell on earth; but to the other 99.9%, not so much. This is a very well written article, with lots of interesting anecdotes, ideas and pics. It’s laid out quite well, except for the optional hanging indents (which I prefer in long articles, since it gives the eye an extra “break”, thereby avoiding eye fatigue. I only noticed one typo. Here’s where the concept is incorrect (I’d add, “in my opinion” except for the fact that I am correct). The article assumes that we will have money and debt and the same static social philosophies in the future as we’ve had in the past, as far as humans can remember. The article is like a 1945’s sci-fi writer’s view of 1985. The fact is, money is going the way of the CD player. With a slight technological boost, a wild and crazy revolution, and radical reboot of consciousness, this society will completely be “over” the concept of money, coveting things, greed, and all the BS that has plagued mankind since it’s stone knives and bear skin beginnings. Here’s the thing. 1). People are basically good. 2). People act crazy when whey covey other people’s stuff to the extreme. 3.) Debt society makes people even crazier. Technology to the rescue. Technology is a juggernaut that can’t be stopped. We already have quantum computing; we have 3D printing; we already have, and have embraced the concept of quantum entanglement. It won’t be long before someone creates a way to 3D print usable commodities out of thin air at zero cost. This event with make money instantly obsolete. The invention of the replicator will be the grand equalizer that will alleviate the psychosis triggering pressure that humans are under to continually “product” and “provide” and all that malarkey. When this pressure is finally gone, humans will revert to what they do best… work toward self-improvement, compassion and understanding of other humans. Everything else is BS. One more thing… When people start being immortal, they will gradually stop mindlessly reproducing. Global population will plateau at a reasonable, sustainable number. One of the stress-factors humans deal with is crowded, uncomfortable living spaces due to overpopulation. A natural, “right-sizing” of humanity will occur so we can all live comfortably on the planet indefinitely.